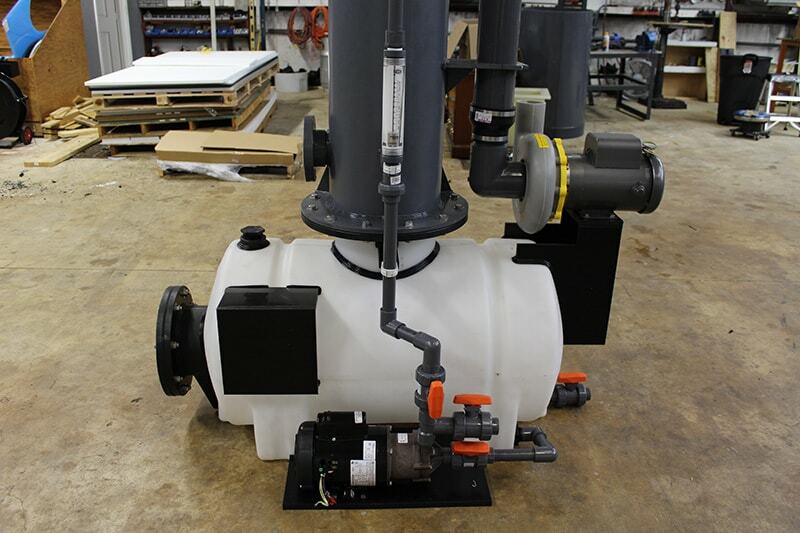 Protank is a fabricator of custom fume scrubbers and scrubber tanks. 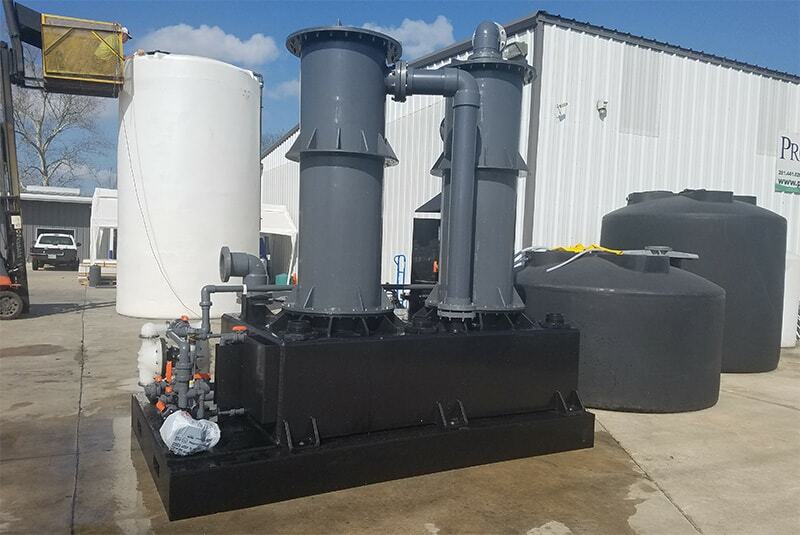 Protank is experienced in fully producing highly efficient, minimal maintenance scrubbers and scrubber tanks according to our customers’ unique design requirements. We provide wet and dry scrubber systems capable of removing contaminants through gas absorption or by mechanical contact. Applicable contaminates include inorganic chemical gases, acid gases, alkaline (base) fumes, particulates such as dust, and odors. Protank designs horizontal crossflow and vertical countercurrent fume scrubbers and can do so according to your custom parameter needs and scrubber specifications. 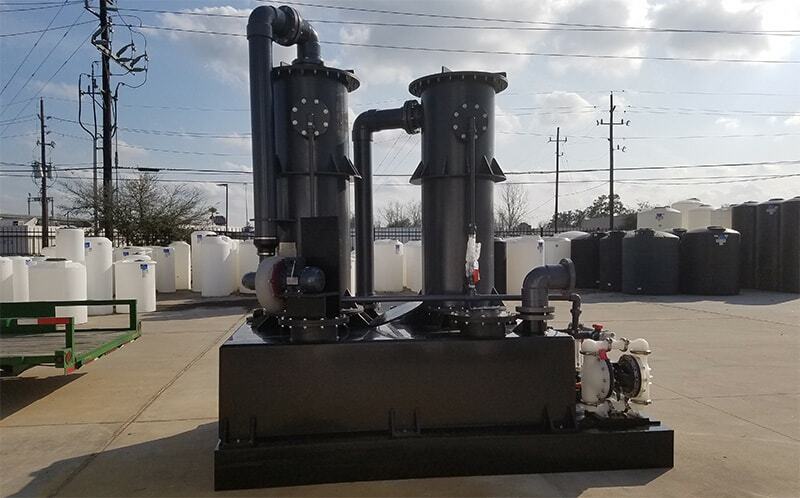 The following is information concerning fume scrubbers and tank definitions, applications, names of parts and types, as well as examples of Protank’s quality custom projects. Let's discuss your scrubber project. Click here for our contact information. What is a fume scrubber or scrubber tank? 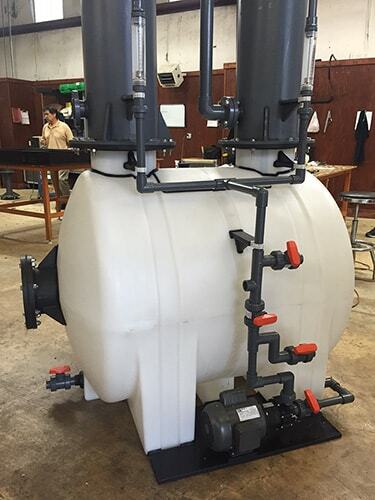 A fume scrubber of scrubber tank is a chemically corrosion resistant, pollution control instrument engineered to mitigate chemical gases, particulates, odors, acid / alkaline fumes, or toxic vapors by passing them through a medium designed to react with, adsorb to, or dissolve the undesired vapors. Why are chemical scrubbers needed? 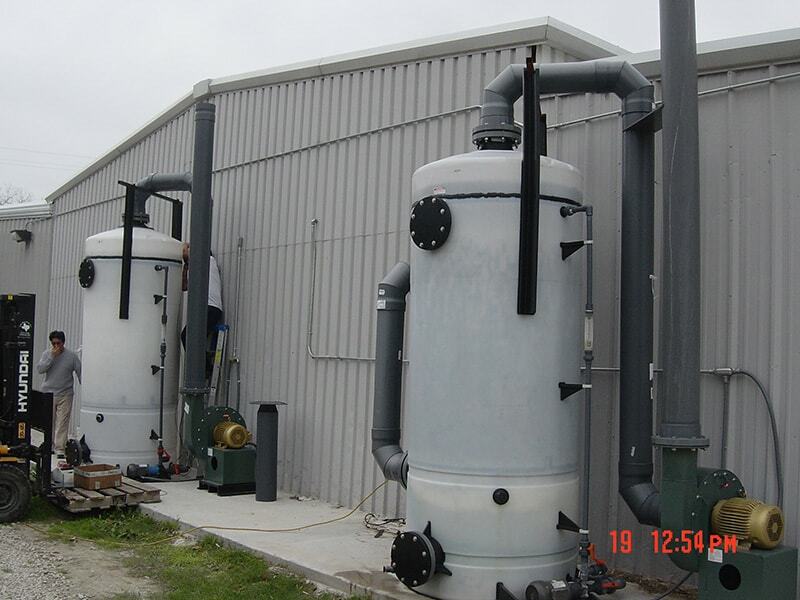 Fume scrubbers or scrubber tanks are needed in chemical application scenarios where generated vapor fumes pose a hazard to human health, tank or system integrity, and/or the environment. They are used in volatile chemical storage applications where the fumes are federally regulated air pollutants. A common example of such a case is hydrochloric acid, HCl. Basic venting of chemical tank systems normally includes vent pipes of sufficient diameter that are open to the general atmosphere. Basic venting may be suitable for inert, non-volatile chemicals, chemicals that generate non-noxious, non-corrosive, or non-regulated fumes, or for applications that do not generate fumes above regulatory permit limits. For all other potential chemical situations, a fume scrubber or scrubber tank may be appropriate. If you are unsure of your specific chemical application requirements, we encourage you to evaluate governing laws and regulations concerning chemical emissions. Fume scrubbers, also referenced as gas scrubbers, are classified as wet or dry systems based on the method of vapor mitigation. Scrubber systems can be designed with either a horizontal or vertical orientation of operation. Wet scrubbers are the type most commonly utilized in standard chemical application scenarios. Wet scrubbers function by driving the generated gaseous stream through a scrubbing solution prior to its atmospheric discharge. This process dissolves vapors in the scrubbing media and/or dilutes the amount of fumes reaching the external vent pipe. For wet scrubber type systems, water is a commonly used scrubber solution. In certain scenarios, water is not applicable as a scrubbing medium due to a decreased affinity and solubility with the generated vapors and a specific chemical or reagent scrubbing solution is required. In order to be effective, the scrubbing media / adsorbent should have high chemical solubility with the generated gases. For low water solubility compounds, such as hydrogen sulfide or hydrocarbons, amines or dimethylaniline are often used. Sodium hydroxide, NaOH, is the most common alkaline material utilized in wet scrubber systems. The scrubbing medium in wet scrubber systems will eventually be exhausted from use. This occurs due to over-accumulation of dissolved chemical gases in the adsorbent solution depleting the available media. For this reason, use of inexpensive scrubbing solutions is advised and proper, regular scrubber inspection and maintenance schedules followed. Dry scrubbers are largely used to remove the acidic gases that result from combustion processes. Dry scrubbers operate due to a dry, gas-absorbing material that evolving fumes will be absorbed to and effectively neutralized. Dry scrubber types are known as physical adsorption systems. Activated carbon is a common dry adsorbent material. As with wet systems, the medium used in dry scrubber systems too is eventually exhausted. The material becomes inert due to depleted chemical binding sites on the adsorbent material. Proper maintenance and medium replacement schedules should be followed. Horizontal and vertical scrubber systems are defined by the direction of system airflow and their constructional directions. 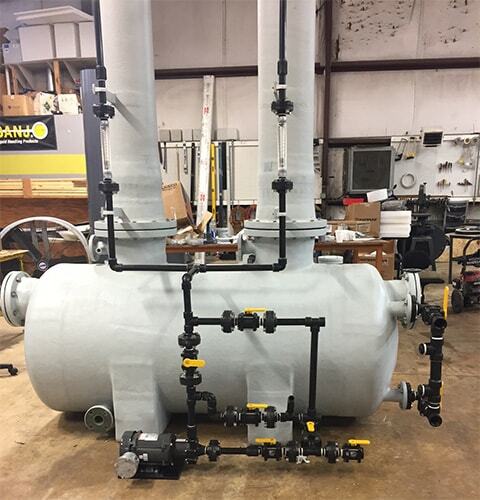 Standard construction materials for Protank’s custom chemical-based application fume scrubbers and scrubber tanks include PVC, CPVC, polypropylene, fiberglass/FRP, and stainless steel.